My friend +Adam Slobodian told me about a new app called Snap. He said this was an app he was looking for since coming back to Android from iOS. He had missed being able to access widgets from any screen on his device, not just the home screen. There's not a whole lot too this app when it comes to explaining it. You drag your finger down from the top of the screen - either from the left, middle, or right - you get to choose. 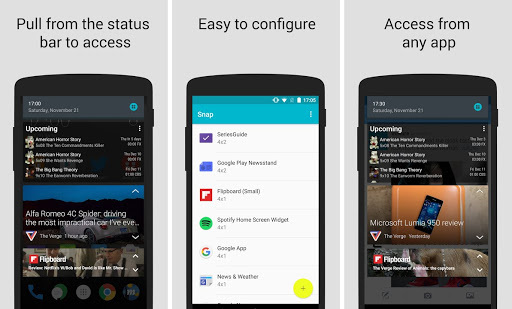 Once revealed, it looks just like a stock Android notification drawer, accept it is full of your widgets. 3 maximum if you use the free app, or more if you pay $2.69 CAD for Snap Prime. 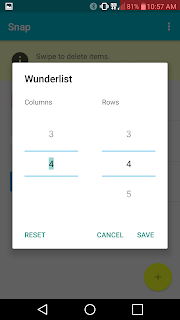 You can adjust your widget sizes by clicking on them in the app settings, which will then let you select the size by columns and rows. 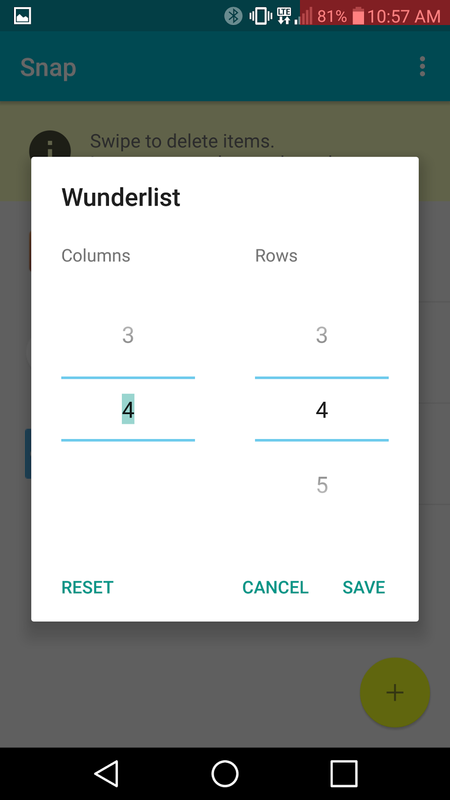 In my case, the Wunderlist default of 4x2 was just too small, so it is great I can increase the height. Since I have this app installed and tested, I've already moved my Sunrise Calendar widget, Wunderlist widget, and KeyRing widget to Snap. In turn, my home screens in Nova Launcher is back down to just one home screen. I will state there is one thing Snap has done that I don't care for. When you're scrolling several widgets, they overlap (stack). If any of your widgets are transparent, this can make things a little odd. In my case, I had to show my Wunderlist widget before the Sunrise Calendar widget to make my calendar viewable. Not a big deal, but something to be aware of.